Explore a newly-discovered ruin and find out where the fabricants originate. Speak with Tienius Delitian or Fedris Hler and receive orders to investigate the recent Plaza attacks. Enter the ruins of Bamz-Amschend beneath the center of the Plaza Brindisi Dorom. Enter the ruins and witness the scene in the first chamber. Return to Tienius or Fedris to report your findings. After the Attack on Mournhold is stopped, speak to either a Royal Guard or a High Ordinator. The former will order you to inform Tienius Delitian of the attack, while the latter will tell you to report to Fedris Hler instead. No matter which of the two you see, you will receive orders to investigate the source of the attacks. Apparently a passage has opened up under the Plaza that leads to a previously-unknown Dwemer Ruin. You are to report back, as soon as you have information on the origin of the creatures that attacked the city. Return to the Plaza and descend the ladder that has been placed inside the hole within the statue's dais. Walk along the passage until you witness the battle taking place under the city. The guards and ordinators were not the only ones fighting the fabricants; the Dwemer robots of the ruin are also fighting the new machines. Once you have witnessed the scene you should receive a journal update. Return to your quest giver and report your findings. If you return to Tienius, he will tell you to talk to the King for further orders; Fedris will direct you to Almalexia instead. Consider looting the Dwarven Shock Darts from the Centurion Archers, once the battle has died down. It is a far better idea to report your findings to Tienius instead of Fedris. Reporting to Fedris will skip two optional quests you can receive from King Helseth that have very good rewards. After completing them, you are directed to proceed with Almalexia's quests just as you would have done upon speaking to Fedris. 10 Fedris Hler has told me to investigate the source of the attacks on the city. A passageway to an underground Dwemer ruin has opened in the Plaza, and I am to explore the area and report to Drin as soon as I have information on the creatures' origin. The entrance is in the ruins of the Memorial Statue. 12 Delitian knows I have reported the attack to Hler, and he would also like me to investigate the source of the attacks. He suggests that I should report the findings to him, as it is a concern for the Empire. 15 Tienius Delitian has told me to investigate the source of the attacks on the city. A passageway to an underground Dwemer ruin has opened in the Plaza, and I am to explore the area and report to Delitian as soon as I have information on the creatures' origin. The entrance is in the ruins of the Memorial Statue. 17 Hler has heard that I reported the attack to Tienius Delitian. He would also like me to investigate the source of the attacks, but he believes this is a matter for the Temple to deal with. 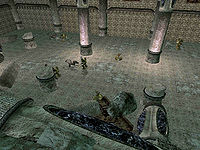 50 I have witnessed Dwemer constructs and these mysterious new Fabricant creatures battling in the ruins of Bamz-Amschend. The Dwemer creatures seemed to be defending the ruins against the intruding constructs. Their origin is still a mystery to me, but it is clear that they are not of Dwemer make. I should report my findings immediately. 100 Finishes quest I have reported to Tienius Delitian about the fight I witnessed in the ruins of Bamz-Amschend. He tells me the King would like to speak with me. 105 Finishes quest I have reported to Fedris Hler about the fight I witnessed in the ruins of Bamz-Amschend. I should relay the information to Almalexia.